Practical learning from start to finish facilitated by an expert who properly balanced the delivery of his material. Looking forward to the next 3 sessions to get my Green Belt! "Finally completed my training on Lean Six Sigma Green Belt Certification Program. Thank you Whitehall Management Consulting Inc. and to our Master Black Belt Rex Jayson Tuozo. I'm proud as well to be now part of Whitehall Alumni. The weekly flights from Cebu to Manila were worth it. With a new perspective of solving operational problems, hopefully with full support, I'm more than eager to contribute efficient solutions and bring my team to new heights. " Felcar Nuñez, USRNNurse Clinician Services Associate Manager at Accenture Inc.
"Wohoo certified yellow belter! It was a great training experience for me and I'm glad I took this training. It's simplified and easy to understand." “Having a degree in Applied Mathematics, I thought that the Lean Six Sigma Green Belt Program would just be a refresher for me. But I was wrong! The training did surpass my expectations as it did not only educate me on how to find the most efficient solutions, but also equipped me with the most efficient way in doing so. Solution is always the end product; however, obtaining it can be very challenging especially if you don’t have a very structured and organized way of attacking your project - And that basically is the best takeaway I got from the course. The project I did for my company has been a recurring problem which has been attempted to be solved a lot of times, but to no success. When I reviewed the previous projects, I have noticed that no organized and scientific manner was actually performed. In fact, there was no clear definition of the problem and success, no quantitative measurable parameters, and what have you. Making use of the DMAIC principle, doing a lot of brainstorming sessions involving all the stakeholders, and performing the Root Cause analysis actually completed the puzzle – increasing our performance by more than two-fold. Thanks to the LSSGB Training I had taken! "The Lean Six Sigma Green Belt program was excellent! Highly enjoyable days. Rex was excellent!- combining theories and examples. I already recommended this training to my support group. More power!" "I enjoy the experiential way of Six Sigma Philippines- iAcademy in teaching Lean Six Sigma Black Belt. It's more efficient, effective and never boring to tackle every topic." "Attending the Greenbelt seminar has had a great added value for my overall Six Sigma training. If you look at it from the DMAIC point of view- it helped me to define and summarize my previously gathered experience into a much deeper understanding. It aided me in determining my baseline abilities, consistently analyzing them during my teamwork with the other wave-mates, which eventually helped me improve my initial process improvement skills. It also equipped me with further knowledge and motivation on how to control, innovate and expand my skills in the future. " Paragon International Customer Care Ltd.
"Rex is really knowledgeable in Six Sigma and has good rapport. He really made a technical subject, Six Sigma, very practical to executives like us. He's not a show-off, but rather use practical examples to make six sigma tools and methodologies easier to implement." "Thank u for making 6 sigma "easier" to learn. I really hope to finish my project and improve the process I'm handling." He is amazing at turning theory into practical things for students to understand. Able to make complicated topics understandable and clear. His examples were very practical and everybody could relate and contribute ideas. He was able to command respect and get the attention of his students even from the first day of training he handled the class very well. Starts on time, has timer for every activity so that it doesn't go out of hand. "What I like most about the program is the Rex's energy and the way he makes it applicable to our operations"
"Highly informative, interactive, easy to digest, and basics appear to be applicable"
"Excellent mix of lectures and activities"
"Rex made Six Sigma easy and fun. He also made great dynamics with the team"
"Rex made the program lively, very practical & simplified approach." "It was a great learning experience and would like to thank you. Such a great help. Travelling from Cebu to Manila to attend this 1-day Yellow Belt workshop is all worth it." "I have attended 2 Six Sigma Yellow Belt training programs before and this is a lot better. Very practical, easy to understand unlike others who make (it) so complicated. Attending this 1 day Yellow Belt workshop is a blast! I have learned a lot of process improvement tools today which I can immediately use. Not your typical Six Sigma class where you read boring power point presentations, flipping of binders, listening to egoistic Black Belts. I have learned a lot in one day, can't imagine what more to learn if I attend your Green or Black Belt programs." "Thank you for an entertaining but highly valuable event. I look forward to continue and attend your Six Sigma Green Belt Certification program"
"Great job Rex! I really had fun in the Six Sigma Yellow Belt workshop. I look forward to be certified by Six Sigma Philippines soon. Thank you for sharing your expertise with us." "Great work. Looking forward to learn more"
"Thank you for sharing your Six Sigma knowledge." Executive learning at it's finest! This is by far, the most brilliant approach to interactive learning that I have seen in a long time. Very highly recommended for those who are looking to further their education and maximize their career development. Best investment I've ever made! I've just finished 6sigma earlier today and I was impress on how the program was setup, worth my time and money that has result and has a real investment value. Excellent workshop! Very informative and focussed on need to know concepts and tools. Acquired plethora of useful tips and practical guides how to add value on every project. Highly recommended. "Rex is the exact definition of a Six Sigma Master Black Belt. Program is accelerated but each topic was explained very well." "Reading from different modules and listening to my adviser, I can say that I have learned a lot from the Six Sigma module. Each module presented each unique method and idea on how one can both increase efficiency or productivity and in the same decrease its cost. I was able to apply these ideas in my daily work and it also enhanced on how I view things. It gives me a different perspective on how I tackle these problems. I am also able to use different statistical methods that I have learned from Six Sigma in finding or discovering out what is needed to be improved. It basically help me point out the root cause of a problem. Last but not the least, what Six Sigma has taught is discipline and patience. Discipline in a way that nothing comes out what you always wanted. One must never give up if it does not work but instead look for another way in tackling them. Currently, one of my job description is to innovate and improve the processes of every department. Everyday, I look at statistical reports find the gap, and see what is causing it to happen. The Six Sigma modules has directed me looking into these reports and provided me different insights on how I can tackle them. Although the modules were there, it was always my adviser who has guided me into using them. The modules were just there to remember what I have learned, but it was my adviser who help me apply them. He taught me a process or technique on how one can find the solutions of a problem and in the same time work this out as a team. This has really worked well a lot as ideas have popped out and has increase our productivity as a group." 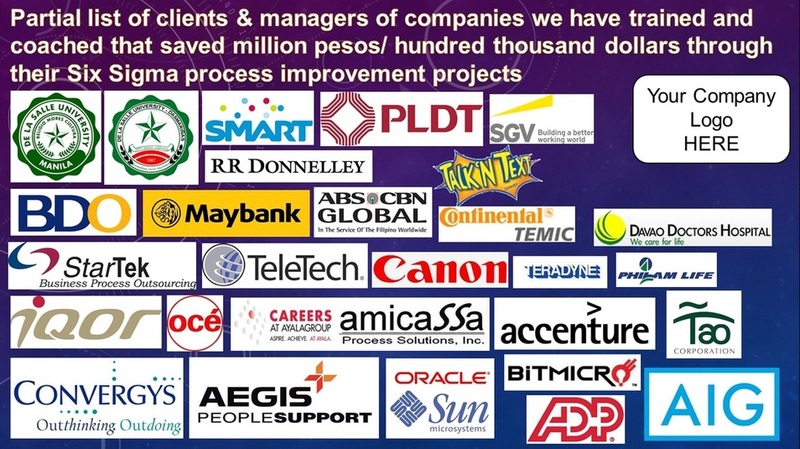 "I find the program very beneficial to BPO executives. Lots of ways to do things better by managing the resources and process using Six Sigma aspect. Rex & Six Sigma Philippines facilitated the Lean Six Sigma Green Belt Program beyond my expectation. I will have no doubt recommending their offerings. Thanks and all the best!" "A highly interactive, in-depth training program and thorougly enjoying. Thanks Rex for making Lean Six Sigma interesting and understandable for us at all levels. I can now go back and apply the learning in the manufacturing industry"
"Six Sigma Green Belt sounds too complicated... but the way Rex Tuozo, a Six Sigma Master Balck Belt made it fun, easy, interesting, and very interactive... an excellent way of learning Six Sigma methodologies and tools. Thanks Rex :) "
"Thank you Rex Jayson for facilitating the workshop. I am amazed at the value of information that is packed into 1 day workshop. Thank you for your positive energy and fabulous information. Looking forward to our next training session (soon)." As a business consultant and operations manager, I learn many useful tools and frameworks in this Six Sigma Green Belt course. I will apply the methodologies in my current job. Rex is an outstanding and charismatic trainer. He is very creative and knows how to make the class interesting. From the bottom of my heart, I would like to thank you, and say good job! "The Lean Six Sigma Green Belt training conducted by Rex Tuozo has been very exciting for me. It opened my eyes to the right way of looking at process and system defects and how to approach and improve it scientifically and how to make the process work to the advantage of the company, the client and the employees who are doing the process"
HR Manager “Thank you for giving me such an opportunity. I learned a lot from the 1-day session that we had. I wish I could have taken a longer course since we barely scratched the surface. I know there’s still much to learn. However, I did not have much time. I already mentioned my interest to go through the green belt training to my boss though. He said we might be able to include that in one of his plans for me in the very near future. So do get in touch. “Workshop we had was very exciting and effective. Instructor was also very efficient and everything was discussed very clearly. I honestly am more compelled to go further. However, it would be helpful if we use a bigger room for this workshop just so we can be more comfortable. Nonetheless, the training was still effective given the sort of confined space allotted. "We have the rare opportunity to invite Rex as a Conference Resource Speaker in Lean Six Sigma Conference 2012. Rex showed deep and detailed knowledge of the subject matter assigned to him. He knows his stuff well and very insightful. Indeed, an Expert caliber! Rex is very personable and can work well with others in the Team. He showed us high level of consistency and reliability in his work. He is trustworthy and very professional. Kudos!" "The speaker maintained poise and pace on the entire day/week. The program is interactive, with activities that pts theories into simple and easy to understand situations"
"Topics were delivered in a simple and understandable way." "The trainer is open to questions and confrontations. He can clearly explain when attendees are in doubt"
"He mad complex topics easy to understand"
"Presentations and illustrations were made simple. Practical examples were discussed. Great trainer (Thumbs up!)" "I gained a lot of knowledge about six sigma methodology and process improvement tools. The speaker gave additional inputs at the end of each group reporting which helped integrate all the lessons learned from each exercise."